Hollywood actor and producer Brad Pitt arrived this past Monday, July 11th in Cancun to promote his new film “Moneyball” as part of the Summer of Sony 2011, during which this tourist destination becomes an extension of Hollywood for almost a week as many artists present their new productions. “Moneyball” is the cinematic adaptation of the book Moneyball: The Art of Winning an Unfair Game, written by Michael Lewis. The storyline tells how a modest baseball team, the Oakland Athletics, didn’t need large sums of money to make it to the World Series, thanks to clever use of statistical data by Billy Beane, played by Brad Pitt. Screenwriters Steven Zaillian of “Schindler’s List” and Aaron Sorkin of “The Social Network” have united their talents to tell the story. The film is directed by Bennett Miller, who directed Oscar winner Philip Seymour Hoffman in “Capote”. 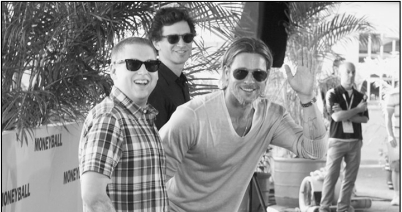 Actors Jonah Hill, Philip Seymour Hoffman, Robin Wright and Stephen Bishop share the screen with Pitt in “Moneyball”.